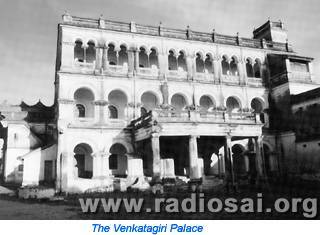 Till about fifty years ago, Venkatagiri used to be a Princely state. It is located about a hundred kilometres north of Chennai. After Independence, all the Princely states in British India merged either with India or with Pakistan, depending upon their location and demographic composition. The Rajah of Venkatagiri was one of the early devotees of Baba. He was an interesting mixture of the oriental and the occident. He was educated in England, mingled with international socialites, hunted big game, and played polo. He was a towering personality, princely in demeanour, and spoke English like an English gentleman. Yet, in religious matters, he was an orthodox Hindu. A deeply religious man, he was an ardent worshipper of Lord Rama. 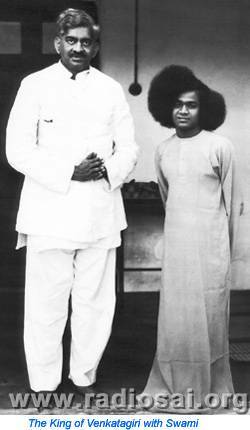 He first saw Swami when Bhagavan was just emerging from His teens. One look and the Rajah became instantly convinced that this was his dear Lord Rama come again. From that day, Rama became ‘Sairama’ for the Rajah. 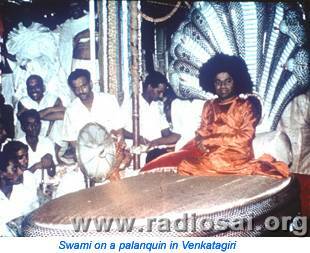 Swami often went to Venkatagiri and spent long spells there. The company was most congenial, being full of learned Vedic scholars, and music lovers. In fact, Baba even used to give private music concerts! When it was time for Swami to go back, the Rajah would lie down on the road as Swami’s car passed by. The roads were not paved, and the car would kick up a lot of dust. The devout Rajah wanted the sacred dust to literally bathe him – so intense was his adoration of Baba! To ensure that the dust was raised solely by Baba’s vehicle, the Rajah forbade other vehicles to pass on the road; Swami’s vehicle was the only one allowed to travel on the road. The Rajah it was who used to organise festivals in Puttaparthi in those days, and provide all the necessary arrangements. Swami often speaks nostalgically of the Rajah, describing him as a loyal devotee next only to Hanuman – that is extra-ordinarily high praise, coming from Bhagavan. We present below, excerpts from a long conversation with the younger son of the Rajah, VGK Yachendra (VGK) recorded by Radio Sai for archival purposes. The person in conversation with the Rajah's son is Prof. G. Venkataraman (GV). Venkatagiri has been, for centuries, the seat of a Royal family dedicated to the support, protection, and the promotion of Dharma. Consider how many temples have been built or renovated and maintained by its munificence! Take count of the Vedic Pandits [scholars] the family has patronised so far, and the number of religious books its donations have helped to reach the masses. See the interest the family takes even now, for the uplift of temples and mutts [religious establishments], although their State and status have been overwhelmed by the storm of political change. - Bhagavan Baba, 18th Feb 1964. GV: Sai Ram and welcome to our studio. I request you to say a few things about your life. VGK: My father was the last Rajah in Venkatagiri. After the abolition of the Princely states no one else was coronated. But my elder brother still has the title. GV: What is your brother's name? VGK: It is a big name, but I will tell you the initials: VVVRK Yachendra. Yachendra is a common name for all of us. My name is VGK Yachendra - Gopala Krishna Yachendra. My father first came to know about Swami in 1948. We had a very big bungalow then in Bangalore with 21 acres behind the Mysore Maharajah's palace, and Swami used to stay in that house. 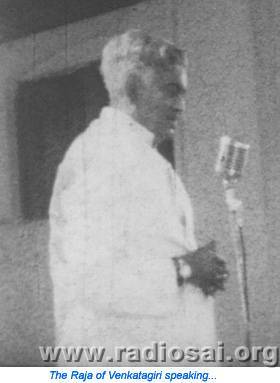 GV: How did your father come to hear about Swami in 1948? VGK: A relation told him that there is a great Mahatma staying in Puttaparthi. 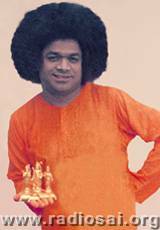 At that time Swami happened to be in Bangalore in Sakkama's house. My father was a great Rama Bhakta. My grandmother died in 1947 and Swami made His first visit to Venkatagiri in 1950. My father asked Swami to show my grandmother. Her name was Ratnamma. He said “Ratnamma come.” From the wall she came in flesh and blood - not as an apparition, a dream-like thing or hazy. She appeared actually as she was. We touched her feet. She told my father that "He is the Sri Rama that you are worshipping but in His characteristics He is like Sri Krishna. He will try to dupe you to see that you go away from His fold. So be careful; do not leave Him." After a few minutes she slowly went back to where she came from. This was in August 1950. 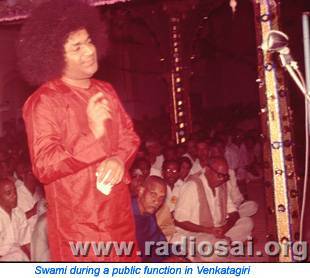 That was the first time Swami came to Venkatagiri. GV: You all met Him two years earlier in Sakamma's house. Tell us about that. VGK: We were there along with 50-100 people waiting outside. Somebody went inside and said the Rajah of Venkatagiri has come. Swami said "What has he got any horns on his head? Let him wait, I will see him later". So He did not see us at all for five days, though we were waiting from morning till evening. Our servant maids were given interview before us! Clearly it was all Swami's test for us. My father was a very religious man and had faith. So we waited and on the fifth day the entire family was called. The first miracle that our family witnessed, concerns me. I was having eczema, and a liquid with a foul smell used to ooze out. 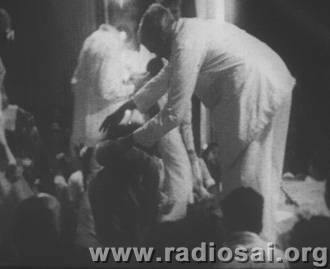 The first thing that Swami did was to touch me all over the place - and miracle of miracles till today there is no eczema. And He did it without anybody even asking Him to cure me. In 1950 my father came to Puttaparthi and during that trip opened the Bukkapatnam High School . That was the first time anyone in my family came to Puttaparthi. GV: How come your father opened the Bukkapatnam High School ? VGK: Swami asked him to when we met Him in Bangalore. In 1949 we stayed in our Bangalore house for the summer. We played cricket and my father was a great polo player. GV: Talking of cricket Mr. G.V. Subba Rao was recalling the time when your father commanded you to attend on Swami. But the Ranjit trophy cricket match was being played then in Madras and you were very keen to hear the running commentary on the radio. VGK: Not the Ranjit trophy; it was a test match between India and the West Indies. GV: What Mr. Subba Rao said was that Swami gave the running commentary while you were with Him. VGK: The entire thing, as if He was seeing it! How Hazare felt that he had hurt his ankle when he took a catch and fell down. GV: I saw that match - Everton Weekes was run out on 90. Let us get back to your father's first visit to Puttaparthi. VGK: During that visit, my father requested Swami to visit Venkatagiri. Swami agreed and said "You send somebody and I will come." At that time Swami did not have a car. So father agreed and a date was fixed just after Krishnastami. At that time I was an atheist. GV: My God, with such a father! You remained atheist even after seeing the miracle cure done to you? VGK: Yes, I took it all with a pinch of salt. I was not impressed then. My father said "Go and bring Swami." I replied “Father, I will not go. You send someone else." So one of my relations who happened to be the Headmaster of my old school in Venkatagiri was asked to go and bring Swami. That car was scheduled to leave Venkatagiri at 5.30 A.M. However, at midnight Swami appeared in my dream and gave me mangoes. After eating those mangoes I had a terrible urge to start immediately for Puttaparthi. So I went and woke father and told him that I was going immediately; he was very happy that I was going. One thing that my father told me was that whenever I passed an important town such as Madanapalli or Kadari, I was to send a telegram. My father explained, "Based on your information, I will be ready with poornakumba and elephants to take Swami in a procession." I agreed to do as he asked me to. When I came to Puttaparthi it was Krishnastami and Swami was staying in the old Mandir. I went there. Suddenly Swami assumed a blue appearance. Not just to myself but to so many others as well. Swami was blue with namam and with peacock feathers in His hair. We then sang Bhajans, after which we went to bed. Early morning we started. At every town we passed through I told Swami that I had to send a telegram. Swami said "It is not necessary: why are you bothered? I am here." So we drove on without sending a telegram. At one place we stopped for lunch. We had some empty vessels. Swami touched them and they were full of sweets and so on. We ate them to our hearts’ content and then we started off again. By the time we reached Tirupathi I was in great jitters, because arrangements were supposed to be made to receive Swami ceremoniously. But when we entered Venkatagiri all the poornakumba, elephants and paraphernalia with servants in turbans were fully there! Swami got down from the car and we took Him in a procession to the palace, where Swami retired to His room. Nobody uses that room till today - it is for Swami. Before Swami came down I confessed to my father that I had not sent any telegrams. He said "You bloody fool; you say that you did not send any telegrams but here they are." He then showed me a bunch of telegrams "Passing through Madanapalli""Going through Kadari" and so on - telegrams from all the towns we had passed through! My father then asked the Postmaster to come and asked him if any telegram had been received. The man said "No sir, we have not received any telegram from any place. ""Then what are these telegrams?" my father demanded. "Sir, these are on official telegram paper no doubt, but there is no stamp of the Post Office" said the Postmaster. There were no stamps on the telegrams because they came direct from Swami! 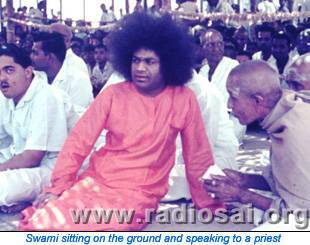 GV: When Swami came to Venkatagiri for the first time, how long did He stay? VGK: Fifteen days and we have kept records of all that He did in diary form. GV: What did Swami do in Venkatagiri? VGK: There were not many public functions. Mainly, He would be talking with the family; not much philosophy; now and then some remarks on the Ramayana. Mostly, He would be joking - suddenly He would ask "What colour dress am I wearing?" In those days He used to wear dresses of all colours. "Swami you are wearing blue." "Dunnapota (buffalo) you must get your eyes checked; you say I am wearing blue but I am wearing red." And I would look and it would be red. Often, He was very playful. "What do you want?" He would ask. He used to give whatever we wanted . One day we were all sitting together, my cousins my brother and so on and He said "What do you want?" I said "I want a mango" - it was December and not the mango season. Somebody said "pear" another person said "apricot" which are not available in Venkatagiri. Swami replied "You want all of them? There is a small tree in the palace. Go and pick them from that tree." And we saw that all the different fruits that we wanted were hanging there - and it was not even a fruit-bearing tree! Swami did not even go anywhere near it. I do not think that I have ever tasted a mango like that in my life. One night He was lying down on the bed and I was massaging His Feet. I was lucky to have this privilege. I do not know what good I had done in previous lives but not in this life. I asked "Swami, what is the difference between You and other saints such as Ramana Maharishi, Ramakrishna Paramahamsa, and Chaitanya Mahaprabhu?" He replied "By their own effort they have risen to the level of Godhead, but with the infinite powers I possess, I have come from the level of Godhead to redeem mankind." This is the exact wording that He said in Telugu. Swami would suddenly get up in the night and would laugh and make gesticulations. I asked Him what He was doing. "I am talking with angels" He replied, "Can't you see?" "How can I see Swami? Give me special eyes so that I can see." "That stage has not come. If you see them now you will lose your eyesight." GV: You said that Swami visited you many times. Did the nature of the visits change in any way? VGK: Very much; every year there was a change. He used to tell us that "This is the 'playful' Leela stage; next comes 'teaching' and afterwards 'service'. What you are experiencing is the playful stage, the Leelas, in the first few years." GV: How long did the Leelas last? VGK: About 4-5 years until the middle of the 50's. 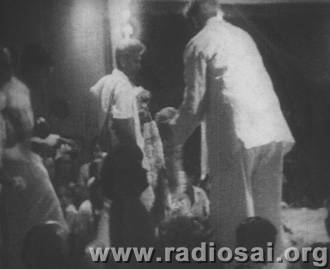 Later the first Divine Life Conference (of Swami Shivananda) was held in Venkatagiri, in 1956 I think. All the people came from the Shivananda Ashram. Swami was considered to be a small boy, illiterate, and 90% of people used to think that He was a magician. Father arranged for a big palanquin and wanted Swami to be carried by the family members. Swami said, "No I do not want to get into the palanquin. I will walk with these sanyasis." So Swami walked from the palace to the town hall where the meeting was held, a distance of about one furlong from the palace. That was the first blow that shattered them - almost. Next, there was a big golden throne that Swami was supposed to sit on but He sat along with all the other people. They thought that He was not well versed in Vedic philosophy and so they all started talking to each other ignoring Swami. They never addressed Him as Bhagavan or even as Sai Baba. Swami was laughing, but I was furious. Swami's turn came, and He started speaking. They all stood up and said “We came here to defy him - but we are defied” and prostrated before Swami. This was the first public meeting with these sanyasis. GV: Once I heard Swami say that in the olden days the Raja of Venkatagiri would organise all the festivals in Puttaparthi as there was no one to do it here and that he would bring all the people from Venkatagiri and arrange the celebrations. Can you tell us about this? VGK: We used to bring Purohits and people who would cook. During Dasara, Swami would feed poor people. Our family members would carry Swami from the Mandir on a palanquin. By the time we came back it used to be between 4 and 5 P.M. In those days many in the village were hostile. They used to sit on the thatched roofs and smoke. Swami would give a look and everyone would disappear. Vibhuti, kum kum turmeric and all sorts of things would come and He would look really ferocious. One of our servants, who was a very weak fellow, managed to throw off a buffalo which had been sent to disrupt the procession - it was one of the greatest miracles that I have seen as none of us together could push the buffalo; but Swami gave him the strength. That was the animosity in those days, in Puttaparthi. GV: Do you have any idea why these people were so hostile? VGK: They used to think that Swami is like them, born here. Why then are so many Rajas, Maharajas, intellectuals and scientists coming to Him? I used to ask Swami what is this? "Dhoshana Bhushanalu samana teesko" – treat praise and blame equally; be indifferent to both - He would laugh and tell us. GV: You said local people were hostile then but they are not so now. How did that change? VGK: Because of the water projects, the hospitals and the colleges. Swami also used to feed people during famines. 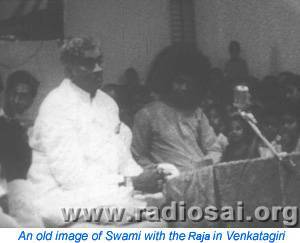 GV: When was Swami’s last visit to Venkatagiri? GV: Was there any reason why He stopped His visits subsequently? VGK: My father died on 1st June 1970. After that Swami did not come. In 1951 Swami said that He would come so we were all making arrangements. Father received a telegram from one of the greatest musicians at that time - Bangalore Nagaratnamma. She came and we asked her how did she come to know of Sai Baba? She said that Thayagaraja the musical saint and a great devotee of Rama appeared in her dream and told her to have the Darshan of Swami. That is how she came to Venkatagiri, in search of Swami. She was about 80 at that time. The minute she saw Swami she sang Kannugontini Sri Rama - Thyagaraja sang the same song after he discovered his lost idol of Rama in the river. And after that Ra Ra Ma Intiki Daka in ragAshaveri. Then Nanu Palimpa Nadachi Ochitivo in rag mohanam. Afterwards, I think to test Swami, she asked for very rare kritis (songs) which are not in vogue generally, such as Raghuvara Aprameya in rag kamboji. They then both sang for nearly two and a half hours - she would ask Swami to sing and then join in and then He would ask her to sing one and He would join with her.Then Swami stopped the singing and asked her what she wanted. She said that she only has two desires; one is that she should not suffer when she dies and the second that she should utter ‘Sai Ram’ at the time. "A party of between twenty and thirty people left the Rajah's Palace in a fleet of cars for a drive in the country. Baba who had never been in the area before, asked the Rajah to stop by any patch of sand they might happen to see. A few miles further on they came to a dry sandy river-bed. Here they stopped, and all sat on the sand around the young Swami. After talking for a while, Baba rolled His sleeve up to the elbow and thrust His hand deep into the sand before Him. Swami then withdrew His arm from the sand, there was a great flash of blue light that spread to a circle some ten feet in radius. Then they all saw that Baba was holding in His hand something about eight inches in height. It proved to be a statue of Lord Rama and His consort Sita." Swami told her that she would die on a particular day about six months later and that she would die peacefully uttering ‘Sai Ram’. Exactly the same thing happened. The attendant who was looking after her came and told us that she passed away peacefully chanting Sai Ram. 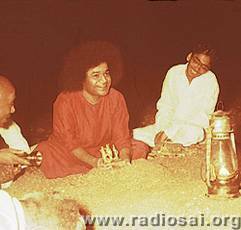 Swami used to come for Bhajans in my house in Madras, near Thousand Lights, located on a 10 acre ground. We would cook food there and sing Bhajans and Swami would give interviews. He used to come to Madras the day following His Birthday and stay till Pongal festival (in mid-January) for one and a half months, all by Himself. I still have a letter where He asks me to come and pick Him up. So I took a car and brought Him to Venkatagiri. Dear Reader, it is actually a very long interview filled with fascinating tales and we hope to publish other excerpts from this conversation later on a suitable occasion.